This first module provides an overview of the Multi-Tiered System of Supports (MTSS), and addresses common myths regarding the MTSS process. 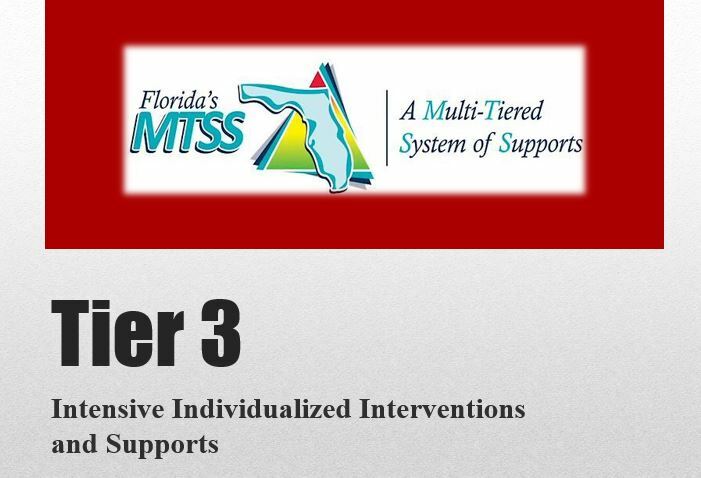 ﻿The Tier 3 Module focuses on intensive individualized interventions and supports. It compares the differences between Tier 2 and Tier 3, and provides guidance for determining which students would benefit from Tier 3 services. The Tier 1 Module addresses the importance of developing a strong core, maximizing academic engaged time, and making critical decisions for students needing more support. ﻿﻿﻿﻿The Gap Analysis & Rate of Progress Module helps educators understand how to schedule interventions with the appropriate time and intensity required to close a student's achievement gap by a target date. The Tier 2 Module describes how to diagnose areas of need in order to design targeted supplemental interventions and supports. ​This document contains a sizable list of general, academic, and behavior specific resources to support MTSS. This is a resource to use when planning for professional development on MTSS. Many of the websites contain helpful strategies and technologies for educators to implement in their classrooms.